Published on March 7, 2009 in About Holy Cross and Believing and Belonging. Closed Tags: baptism, beliefs, membership. We welcome a newly baptized member of the Household of God. Membership means different things in different churches. In the Episcopal Church it’s very simple. To be a member you have to be baptized and you have to have your name recorded on the membership rolls of the church. That’s all! You’re in! If you haven’t been baptized, the vicar will be glad to discuss baptism with you. If you were baptized in a different denomination, the Episcopal Church accepts your baptism; baptism is once-and-for-all, we don’t rebaptize. On another level, membership is not so simple. Here we’re talking not about the institutional level, but the spiritual level. Jesus welcomed all comers, but he also made it clear that to follow him (the “way of the Cross”) required sacrifice and commitment. It’s a truism in life that we can’t get something for nothing; we get out what we put in. We don’t count how often you come or how much you give at Holy Cross. Those things are between you and God. But you need to count them! Casual Christianity, cheap grace, is an illusion. It never works. We like to talk about the “four B’s” at Holy Cross: Belonging, Behaving, Believing, Becoming. They stand in that order. Often people think that believing should come first, but actually we don’t believe in a vacuum. We learn our beliefs by belonging. You can’t be a lone ranger Christian. Christians need to be part of a community. Behaving comes next. Here we don’t mean “acting nice” or adhering to some moralistic code. Jesus tells us not to judge others; leave the judging to God. By behaving, we mean that part of belonging is following the practices that members of a body have adopted. In the case of the Episcopal Church, that means the practices embodied in our Baptismal Covenant: participation in the worship and fellowship of the Church, living a forgiven and examined life, seeking and serving Christ in others. Behaving at this level is the goal and work of a lifetime. Out of belonging and behaving grows believing. The “head part” of Christianity grows out of the “heart” and “hands” part. We recite the Creed every Sunday not because we understand every single part of it, but because we are growing into understanding. Becoming a member of a historic, apostolic Church like the Episcopal Church is like moving into an ancient castle: there are rooms and rooms full of beautiful treasures; we explore them one by one over time, over our lifetimes. Lastly there is becoming, the fourth B. Becoming takes that lifetime and is realized finally only in the glory that awaits us after death. Becoming is ultimately becoming one with Jesus Christ in God the Father. We will not know in this life just what that vision glorious entails. But we will get glimpses of it as we go along. 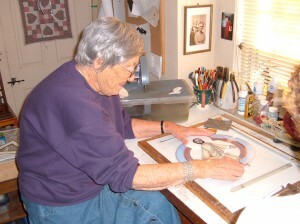 In her eighties, Alice St. Hilaire continues to make beautiful stained glass. Here she works on Stations of the Cross, used during Lent. So, that’s membership at Holy Cross. At one level very simple. At another, anything but. We welcome you to join us on our journey!